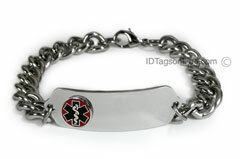 Medical ID Bracelet, IDB42 (size 1-3/4" x 1/2"), is made from .062" thick premium grade Stainless Steel. It is guaranteed to be rust free for the life. The enameled medical logos, which are attached to the plate, come in either red, blue or pink colors. You can choose, also, plain bracelet without logos. The bracelet tag is slightly curved for wrist wear. Please choose correct length of the chain. If you are not sure about right length, please refer to suggested document: "How to choose appropriate length of the Medical ID Bracelet".